July 8, 2012: The researchers have identified approximately 30 variants of interest in our samples, and are running these through further analysis. Additionally, they will be doing a SNP-chip genotyping study which will hopefully increase our chances to find the causative mutation. Additional new samples from carriers and an affected dog are being sent to the lab, which will help Dr. Lohi’s group confirm any findings they may uncover. We should know more in the coming few months. We have informed them that if any funds are needed to accelerate the research, we will do what is needed to provide these through the Canine Health Foundation grant process using our Donor Advised Fund. January, 2012: At the beginning of 2011, we were told that the researcher at MSU who has been working on this project for years, Dr. Pat Venta, was willing to collaborate with another researcher who had more advanced technology in an effort to find this gene. Chondrodysplasia is a genetic disorder in the Alaskan Malamute which manifests itself in puppies born with deformities, eventually evident in the abnormal shape and length of their limbs. Chondrodysplasia is present in adult carriers as an auto-somal or simple recessive gene. Therefore, both sire and dam must carry this gene in order to produce an affected (chondrodysplastic) puppy. As Malamute owners and prospective owners, we have an opportunity to control the proliferation of Chondrodysplasia in the Alaskan Malamute, and with such control, there is hope of its total elimination in our breed. For a number of years, Alaskan Malamute breeders in both the United States and Canada were aware of occasional litters that contained deformed or “dwarf puppies”, produced by parents who showed no physical evidence of the condition. It was not until the early 1970’s that these puppies were conclusively proven to be the manifestation of a genetic disorder. At first, these affected dogs were known as “dwarves” because of their diminutive size. This term gave rise to considerable confusion. Veterinarians associated it with the dwarfism found in Hereford cattle, while owners associated it with any small Malamute. Since neither is correct, another name, Chondrodysplasia(meaning “faulty cartilage”), was coined and brought into usage. Chondrodysplasia in the Malamute was originally diagnosed as a form of rickets. Upon closer examination at various veterinary schools, it was determined that this diagnosis was incorrect. While it isn’t known exactly what this crippling problem is, it has definitely been proven to be genetic, or inherited. A more technical description of this gene is “auto-somal,” or “simple recessive.” This simply means that the sire and dam must both carry this gene in order to produce an affected chondrodysplastic puppy. In very young puppies, under six weeks of age, the deformity is often very difficult, if not impossible, to detect without x-rays, even to the practiced eye. But as the puppies grow older, the deformity becomes more evident in the shape and length of the front legs. However, not all chondrodysplastics are severely affected. In some adults, the front legs may appear “almost” normal. It is not the chondrodysplastics themselves that are the major problem. The greatest concern is the use in breeding of the completely normal appearing dogs that possess or “carry” this gene. (A good parallel of this among humans is two brown-eyes parents producing a blue-eyed baby. In spite of their brown eyes, the parents both “carry” the gene for the blue eye.) While the breeding of two carriers can produce a chondrodysplastic, a litter from a breeding between a carrier and a “non carrier” (or clear) will contain only normal appearing dogs. Nevertheless, an undetermined number of puppies will themselves be carriers, having inherited the gene from their carrier parent. 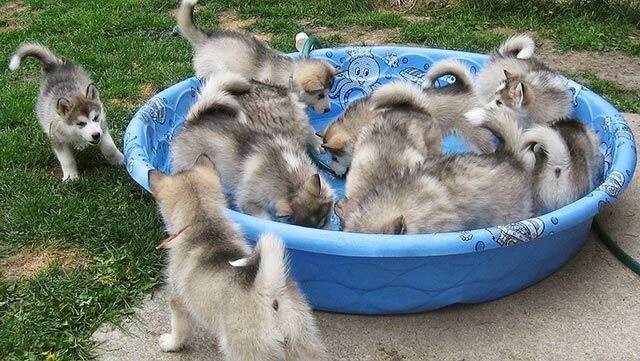 The continued whelping of such litters increase the number of carriers “at large” in the total Malamute population. (i.e. not a carrier), but only that the probability that it is is calculated to be below 6.25%. AMCA is supporting genetic research programs with the intent of finding a DNA marker allowing the proof that a dog is either clear of this genetic disorder or is not. Whenever this test is available, then there will no longer be a need for test breeding to track this condition. The committee will assist the owner in this choice. At present, test breeding a suspect Malamute to a Chondrodysplastic, or to a known carrier, is the only means to be reasonably certain the dog is not a carrier of the gene. Should the owner decide to enter the suspect dog into a test breeding program, a contract specifying certain criteria is entered into with the AMCA Chondrodysplasia Certification Committee. The Committee Chairman and Area Representatives are available for consultation regarding the procedures for test breeding. Once thought to occur only in Malamute, Chondrodysplasia has now been detected in other breeds and the AMCA program has become a model for other breed clubs. Your efforts are needed if it is to continue to fulfill its vital leadership role. We hope you will join us in the fight to control this genetic disorder. It is essential for the prospective malamute purchaser of potential breeding stock to realize the importance of these certificates. By purchasing from AMCA Certified stock, the buyer not only is helping the breed cull out Chondrodysplasia, but is also relieving himself of the responsibility of test breeding.